West Windsor, N.J. – Elyse Diamond of Yardville will join the athletics staff at Mercer County Community College (MCCC) as head coach for women’s soccer. According to MCCC Athletics Director John Simone, Diamond has been part of the college’s athletics network for many years – as a long-time coach at Nottingham High School who saw many of her graduating players join the Mercer team, as the mother of two daughters who played at the college, most recently Katie Diamond, who completed her sophomore season with the Vikings in the fall, and as a 1984 alumna who played two years of Mercer soccer and still holds the record for most goals scored (118 in two seasons). “We are very pleased to have Elyse on board. She has extensive coaching experience working with female athletes and fully understands the role of athletics within the college’s mission. She is a superstar in the soccer community,” Simone said. Diamond’s success on the turf includes a year at Rutgers, where her scoring record was only recently broken by Carli Lloyd (of the U.S. Women’s National Team). Her record of 112 goals as a player at Hamilton High School West also still stands. Diamond comes to Mercer after 25 years as Nottingham’s women's soccer coach and is eager to guide players at the college level. “Girls have only certain knowledge coming out of high school. They don’t fully comprehend the game until they get to college. It’s a lot more physical and it’s longer by ten minutes. Those are crucial minutes. I am looking forward to coaching this age group,” she said. 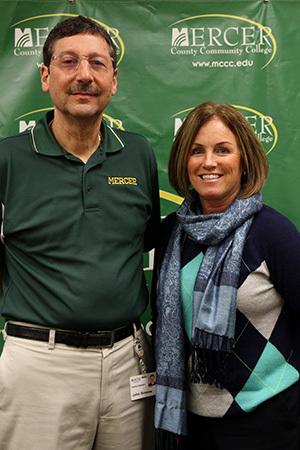 New Head Coach for Women's Soccer Elyse Diamond, with MCCC Athletics Director John Simone. In fact, Diamond has some unfinished business from her own Mercer playing days when the Vikings got knocked out of national contention 1-0 on a fluky goal. “We lost that first game at nationals and then won our next two games 6-0 and 6-1. We were clearly the best team out there, but that first loss placed us in the loser’s bracket. After all these years, I want to take Mercer back to nationals,” Diamond maintains. Nine freshmen are expected to return next season and Diamond will be recruiting throughout the region for strong players to add to the roster so that the team is able to perform at a high level in every game. “We will work on skills while we make everyone feel welcome and part of the program. Team chemistry will be important to our success,” she said. Diamond is well aware that players have multiple demands on their time. “They have schoolwork, and often they have jobs. And, they must be ready to work hard on the field every day. They will need to learn how to balance and prioritize,” she said, noting that she had a job as the assistant to MCCC’s equipment manager, Zinna Kusnirik, while she attended Mercer in the 1980s. After earning her A.A. in Humanities and Social Science in 1984, Diamond transferred to Rutgers and then earned her bachelor’s degree in Health and Physical Education from The College of New Jersey (formerly Trenton State College). She has been a health and physical education teacher in the Hamilton School District for 28 years. Diamond believes in Mercer’s mission, especially in these tough economic times. “Mercer is such a great place to start college. Students save so much money taking their general education classes here – the same classes they would be taking at a four-year college." Diamond will have a chance to get out on the field this spring, when the women’s soccer team will hold practices and play several scrimmages. Practice for the Fall 2016 season gets under way in August. Diamond will be assisted by MCCC soccer alumni Lauren Sparano (’09) and Marissa Segal ('11). She takes over the position from Michelle Ogborn-Haywood, who served as head coach from 2011 to 2015.